EXACTLY 30 years to the day since Eamonn Coghlan won Ireland's first World Championship gold in Helsinki, a teak-tough Corkman, who weighs less than nine stone of sinewy muscle, finally got his just rewards in Moscow. 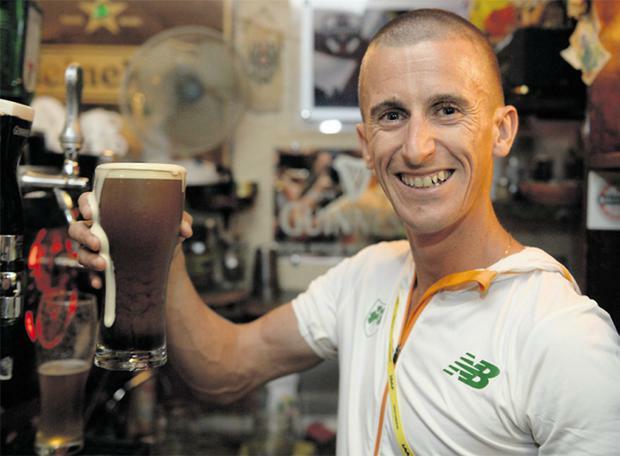 Rob Heffernan now has his eyes set on a podium place at the next Olympics in Rio 2016 when he'll be two years short of his 40th birthday. "Physically and mentally, I've never been better. Age is only a number," he gushed after destroying the field in the Russian captial. The heartache of finishing in sport's most painful place – fourth – more than once in his 13-year career was finally erased when Heffernan won the 50km Walk crown at the World Championships. Not only was he fourth in the 50km in the London Olympics a year ago (where he was also ninth in the 20km) but he actually finished fourth twice in the 2010 European Championships, in the 20km and 50km, which were only three days apart. That was the first time he moved up distances to brave athletics' most gruelling event – five miles longer than a marathon – but it has proven to be his niche. Yet while he believed he could medal in Moscow he did not expect to win gold, admitting that yesterday's victory was "a bit surreal." It was, he revealed, all the more sweet because the Russians, by fair means, and sometimes foul, are the tsars of modern race walking. Heffernan may be diminutive in stature but he has the heart and bottle of a giant and delighted at toppling the local walk kings on their home patch. "I wanted this to be a 'Rocky' scenario, to be an Irishman coming into Moscow and beating the Russians," he beamed after leaving everyone over a minute in his wake. "I knew I was in the shape of my life, physically, mentally, preparation-wise everything was right and I had no excuses," he said after winning Ireland's first world gold in 18 years. "When I came into the stadium and looked up at the big screen and saw myself it was like an out-of-body experience. "Then I thought, 'Hey, I'm looking good and I'm going to win this' and was able to relax and really enjoy that final lap." Eyebrows were raised when neither of Russia's last two world champions (Sergey Kirdyapkin and Sergey Bakulin) started yesterday and their only entries – Ivan Noskov (25) and Mikhail Ryzhov (21) – were relative unknowns. Both were part of an early five-man breakaway but a sub-22 minute 5km then saw Heffernan join them and he started churning out fast splits. The pair went through halfway in 1:50.34 but Heffernan's last four 5km splits – 21:29, 21:18, 21;22 and 21.22 – were metronomic and relentless. By 35km, France's former silver medallist Yohann Diniz was gone (disqualified), Australia's two-time Olympic silver medallist Jared Tallent had faded back and, one kilometre later, just Heffernan and Ryzhov remained in front, locked in a frantic two-man tussle of endurance and concentration. By 45km the gutsy Irish veteran, who had picked up just one red card, had an 18-second lead and he came into the stadium for his final lap 62 seconds clear. Heffernan's winning time of 3:37.56 was the fastest in the world this year by over three minutes, and vindicated his decision to race extremely lightly this season. "There wasn't enough time between races to recover fully, especially given the standard of athletes I'm up against," he revealed, explaining that he even warmed up very lightly (over 400m) yesterday. His time was actually only two seconds slower than the national record he set in the London Olympics, a time that, heartbreakingly, would have been good enough to win silver in Beijing 2008 and gold in every previous Olympic Games. Ryzhov took second in a 3:38.58 PB and Tallent bronze in 3:40.03 and Donegal Olympian Brendan Boyce (26), who has moved to Cork this year to train and be coached by Heffernan, also had the race of his life, finishing 25th in a new personal best of 3:54.24. Only Coghlan (1983) and Sonia O'Sullivan (1995) had won world titles before yesterday and Heffernan was only the fifth Irish athlete to ever medal at this level and the other two were also race walkers: Gillian O'Sullivan (20km silver, 2003) and Olive Loughnane (20km silver, 2009). The Irish team will be hoping that Heffernan's heroics will inspire Newbridge AC's Roseanne Galligan, who broke O'Sullivan's Irish 800m record this summer, in this morning's second 800m heat (7.0).